DVD Maker Pro – Video Photo Burn support burn videos and photo slideshows into DVD . 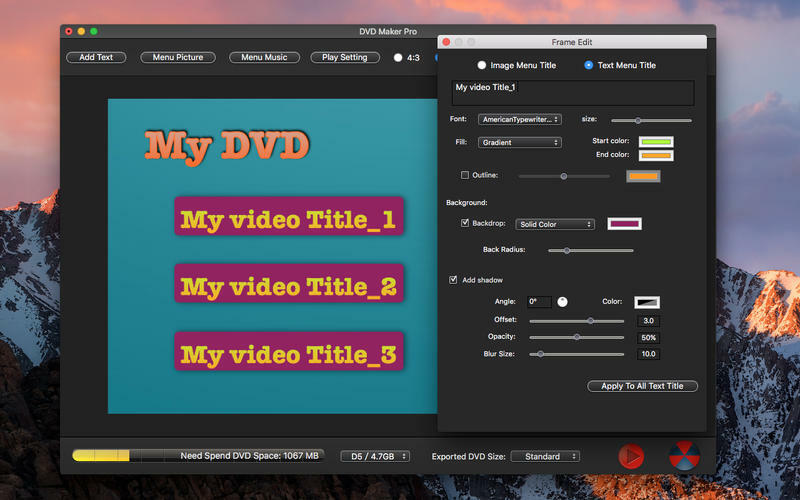 DVD Maker Pro – Video Photo Burn can custom menu background music and background picture, create submenu, add chapters . Besides, this DVD burner lets you edit videos using tools like trim, crop, rotate, watermarks, add subtitle etc . Get DVD Creator and share all your movies with family and friends now. 1. The app can custom your DVD menu’s thumbnails, buttons, frames . 2. The app can can add text on your DVD menu . 3. The app can custom DVD menu background image and music . 4. The app can add photos slideshow as menu background . 5. The app can create submenu for your menu title . 6. The app can add chapters for your video. 7. The app Support text menu title and frame menu . 8. Choose No Menu mode will loop play your videos . 9. Custom preview choose frame color . 10. Custom play button . 1. Crop, trim, rotate your videos . 2. Add image and text watermarks to videos to identify each film as yours. 3. Add subtitle for your video . 4. Adjust video brightness, contrast, saturation and other special effects for a better visual experience. 1. The app support video formats (AVI, Mp4, MOV, M4V, FLV, WMV, MKV, RM , MPEG, TS, RMVB, TP, MTS, M2TS, MPG, Dat, 3GP, 3G2, 3GP2, dv, mod; f4v, ASF and many more). Supports almost all popular videos’ formats to burn into a DVD. 2. Support import almost all photo format . 3. Support 4 output formats: DVD disc, DVD folder, DVDMedia and ISO files to burn. 4. Support all popular recordable disc types ( DVD–5 and DVD–9; DVD-R, DVD+R, DVD-RW, DVD+RW, DVD+R DL, DVD-R DL, DVD-RAM ). * Burn all standard and HD video, photo to DVD with high video quality. * Edit video chapter . * Set title’s thumbnail or text . * Custom DVD 16:9 or 4:3. * Custom TV Standard NTSC or PAL . * Create photos slideshow and burn DVD . * Burn Your DVDs at Top Speed. * Preview your DVD project before burning with a built-in player to ensure all goes as you want. * Save and open project . If you have some problems,Please send an email to [email protected] I will solve these issues as quickly as possible.